For years I have grown cacti in the home's veranda. I didn’t know exactly how to take care of them. Though they survived their growth was very slow and they rarely came into bloom. One day I have built a greenhouse just for the pleasure to eat my own tomatoes. There was a bench in it that looked perfect for some cacti ! They apparently appreciated the treatment : they were bigger and bigger every day (at least I thought so), I have seen flowers on some plants that I couldn’t imagine they were able to. At the end of summer I could notice a difference between new spines and previous ones : they were much more thick and coloured. It was a revelation to me ! So, in 2002, I have built a new greenhouse specially for cacti, that has allowed me to expand my collection. At the time I already had some Sulcos that I had noticed for their willingness to bloom. I liked the older plants forming big clusters. So I began to look at them more seriously. I have bought some more Sulcos and gradually their variability has catched my attention : all those plants with a same name but looking so different ! I have read some books, searched on the Web and especially visited other collectors : I have realised that a Sulco collection could fill up my greenhouse (or even much larger ones) and that’s what’s happening now ! Every year my collection is expanding. The Sulcos are now a real passion for me. I have now added a small collection of Weingartia. 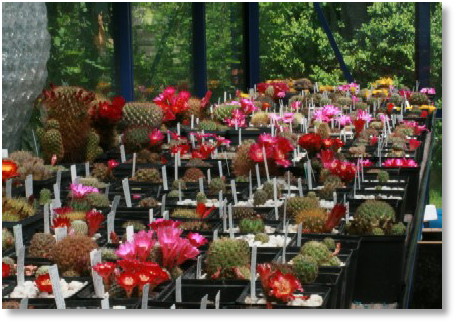 A cacti collection is often seen as a strange and vain occupation. I think that, when everybody is talking about biodiversity preservation, my passion is not so vain. 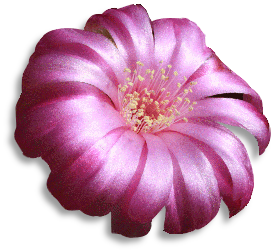 I'm thinking about Echinocactus grusonii : this is a plant you can see everywhere, in the famous Jardin exotique in Monaco and in any hypermarket alike. Nevertheless it is almost extinct in its environment ! So, I don’t know if one day my hobby could save a species but I love the idea and it makes me think that I’m not losing my time while I am in my greenhouse.